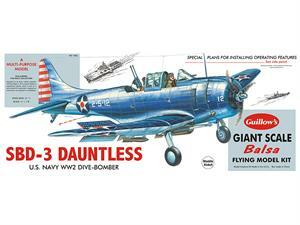 In two early U.S. Navy engagements of World War 2, the Battles of the Coral Sea and Midway Island, the carrier based Dauntless dive bomber played an historic part in blunting the Japanese offensive that began at Pearl Harbor on December 7, 1941. Fulfilling the attack role assigned to it at its conception, the SBD, operating from the decks of the carriers Lexington, Yorktown, Wasp, and Enterprise, mortally damaged the main units of the Japanese carrier fleet and set the stage for the ultimate Allied victory in the Pacific theatre. Not as well known is its impressive record for shooting down enemy aircraft when protecting the U.S. carrier form Japanese air strikes- prowess not expected of a dive-bomber. At war’s end, the claim was made that the Dauntless SBD had sunk more enemy combatant tonnage than all other arms of the service combined.